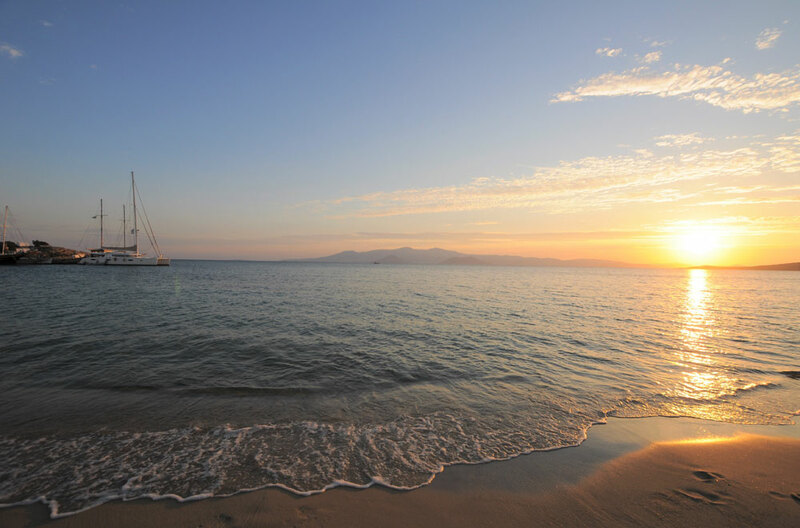 Combine sailing & hiking around the magical islands of the Cyclades for a week. Experience the unique nature and landscapes of these small, non-touristy Greek islands by walking their ancient paths. Walk at the tips of mountains that offer breathtaking views to the Aegean Sea, traditional villages, byzantine and ancient settlements and reach unspoiled beaches where you can rest and have a refreshing swim. We will meet at the island of Naxos in the evening. Briefing, arrangement of provisions and supper at one of our favorite taverns in the Old Town. During the day you can explore the island’s beaches, enjoy a short walk to the temple of Apollo to watch the sunset or walk around the picturesque alleys of the Old Town leading up to the Venetian Castle. We will start the day with a visit to one of the island’s most picturesque villages, Filoti. Within an easy 2-hour walk you will conquer the Cyclades’ highest peak, Zas. The view from the top to the Aegean Sea and the islands of the West and Small Cyclades is really mind-blowing. We’ll rest and have a picnic admiring the panoramic view. We will then descend towards Agia Marina church and go back to the boat. Late in the afternoon we will sail towards the remote bay of Kalando, south of Naxos. After a morning swim we will sail to the little fishing port of Iraklia. Relax, swim and check the island. Early in the evening we will walk from the Chora, Panayia, to the cave of St. John. It’s an hour hike to the largest cave of the Cyclades, famous for its formations of stalactites. On our way back to the village you will enjoy the sunset from the top of the hill. You will have the chance to taste homemade dishes during supper at the local bakery/tavern at the Chora. Sail towards the mountainous island of Amorgos. We will stop on the way for lunch and swim at the crystal clear blue waters of the deserted island of Antikeri. We will continue our sail towards the fishing port of Aegiali where we will spend the night. In the evening, you will enjoy a short hike to the village of Tholaria where you will enjoy traditional island music and delicious dishes at one of its taverns. Today the day will be dedicated to hiking and discovering the island’s northeast area which is characterized as a Natura 2000 area due to its unique flora and nature. We will start our hike from the beautiful village of Langada. We will follow the narrow path towards the impressive church of St. Theologos, where we will rest and have a snack under the shade of one of the church’s outhouses. We will then take the trail towards Stavros enjoying the impressive view of rock formations and deep blue sea underneath. Relax and enjoy one of Aegiali’s beautiful beaches for the rest of the day. We will set sail towards the islands of Koufonisia, known for their crystal clear, turquoise waters and beautiful beaches. We will spend the night on the anchor, at one of the beautiful bays of Kato Koufonisi. In the evening you will enjoy a walk around the island and have supper at the tavern of the only family that lives on the island. They have their own animals and produce all their vegetables and fruits themselves. We will sail towards the island of Paros and the fishing port of PisoLivadi. Early in the evening we will visit one of the oldest villages of Paros, Lefkes, and walk for an hour towards the picturesque village of Prodromos. We will have supper at the local ‘kafeneio’ and enjoy Greek hospitality and homemade food.